Do you want to generate income that increases along with interest rates, with the potential upside from private equity investments? A Business Development Company (BDC), a type of closed-end investment company, could be the answer you’re looking for. BDCs were created by the U.S. Congress back in 1980, as a way to help small- and mid-size businesses grow. They invest in debt and/or equity and often provide operational assistance to the internal management team. Similar to real estate investment trusts (REITs), a BDC distributes at least 90% of its profits as dividends. It’s the dividends that really make BDCs stand out in this rising interest rate environment, especially since trading volatility has spiked of late. A lot of BDC investments are yielding 8%, or higher; but the trick is, to be able to identify which names can sustain and possibly boost those payouts in 2019 and beyond. Ares Capital (ARCC) is the largest publicly-traded BDC both by market value and its $11.5 billion investment portfolio. The company has over 300 current investments and boasts a 12% average annual investor return since its 2004 initial public offering. Back in August, Ares raised its quarterly dividend for the first time in six years, to $0.39 a share (9.4% yield). 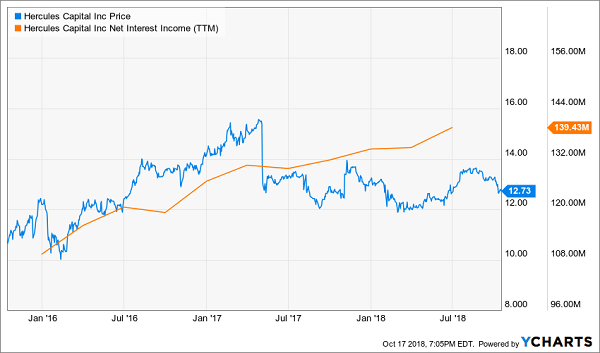 The company matched its payout last quarter with core earnings and reported another $0.21 of investment gains in its reported GAAP net income figure. Management made $1.6 billion of investment commitments in the latest quarter, 99% of which were floating rate debt. On the other hand, 100% of Ares’ borrowing costs are fixed-rate. As a result, the company expects an earnings boost of $0.17 a share for every 1% increase in the LIBOR rate. Management is also looking to step on the gas pedal over the next several quarters and increase its financial leverage, thanks to the Small Business Credit Availability Act (SBCAA) signed by President Trump earlier this year. Given relaxed regulations for the industry, Ares is looking to boost its current debt-to-equity of 0.57x to 0.9x-1.25x over the next three years. Higher investment leverage could lead to higher future profits and dividends for the company, given its rate-sensitive portfolio and consistent track record. 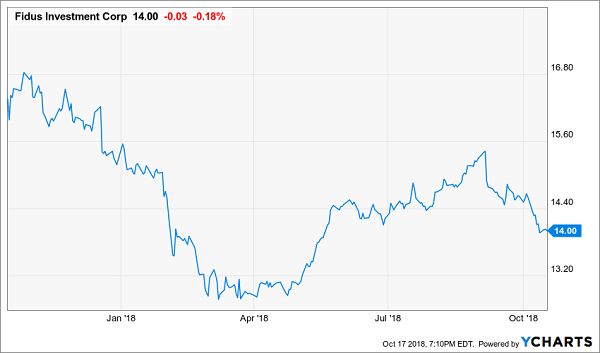 Hercules Capital (HTGC) counts investments in social media leaders like Facebook and Pinterest in its past, but what stands out these days is its earnings momentum. Management has exceeded consensus profit expectations five straight quarters and regularly covers its quarterly distribution of $0.31 a share (9.7% yield). One way the company achieves this is through prudent credit investing. All of Hercules’ investments with a positive fair value were performing and accruing interest as of the end of last quarter. The company also originated a record $463 million of new investment commitments in the latest quarter. Like Ares, Hercules is asking shareholders to increase its financial leverage, in response to relaxed regulations with the SBCAA. That would allow the company to build upon its track record of 16% compound annual net interest income growth since 2011. 97% of its loans are floating-rate and management predicts that earnings per share would increase by $0.16 for every 1% increase in the prime rate. Not all BDCs are created equal, however. Any dividend is really only useful investors if it’s consistent over time and that’s only possible if the payout is supported by underlying profits. Which is why I’m concerned about Fidus Investment (FDUS). The company pays a quarterly dividend of $0.39 a share (11.1% yield), but posted net investment income of just $0.36 in the latest quarter. One reason for the shortfall is that Fidus reported new credit problems with two of its investments last quarter, resulting in both realized and unrealized losses. In addition, only three of the company’s loans are floating-rate, so it’s being left out every time the Fed increases interest rates. 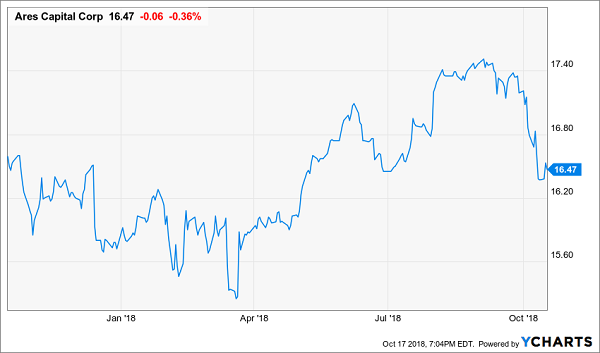 Management claims that it has yet-unrealized equity gains and other funds to support the quarterly payout until profits rebound, but why would investors shoulder that risk at a time when the rest of the industry is playing offense and boosting investment leverage? The BDC is an interesting investment vehicle for today’s rising interest rate environment and trading volatility. When executed well, investors can achieve both income and potential future growth, with the protection from the underlying net asset values. However, Ares is the biggest and one the best operators out there and they’ve raised the dividend once in six years. Hercules is leveraged to rising interest rates, but what if they’re wrong and they increase investment leverage thanks to the SBCAA? Besides, why should you settle for quarterly dividends, if there’s a way to safely receive a consistent 8% yield on a monthly basis? Your bills roll in monthly, why shouldn’t your investments pay you monthly too? 8% a year is 2x to 3x better than what most dividend aristocrats pay and that’s on a quarterly basis. Your bank will pay you monthly, but that’s a 2% rate at best. At those rates, you’d need upwards of $2 million invested to receive the same $40,000 a year of income! My colleague Brett Owens has devised a portfolio that delivers the same income with just 25% of the initial investment. If you have as little as $500,000 saved for retirement, it’s like receiving a paycheck for $3,333 at the end of each month with his strategy. That’s each and every month, regardless of whether the Dow Jones Industrial Average has another 800-point decline in a single day. Or, if your BDC writes off a couple of bad investments and can’t pay its usual dividend this time around. In fact, Brett’s strategy even sets up the potential to see 10% annual upside of your original investment, in addition to the steady income. 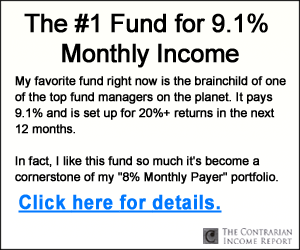 This 8% Monthly Income portfolio is available exclusively for our Contrarian Income Report readers. Brett has scoured lesser-known areas of the market to find these 8 names that will deliver monthly dividend income and avoid the traps that are so common with yields this high. 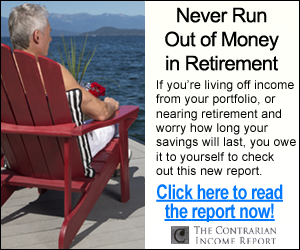 Click here for all the details and begin on the path to retirement with less money than you ever thought possible.